Mary Quinn's mother and brother are there. 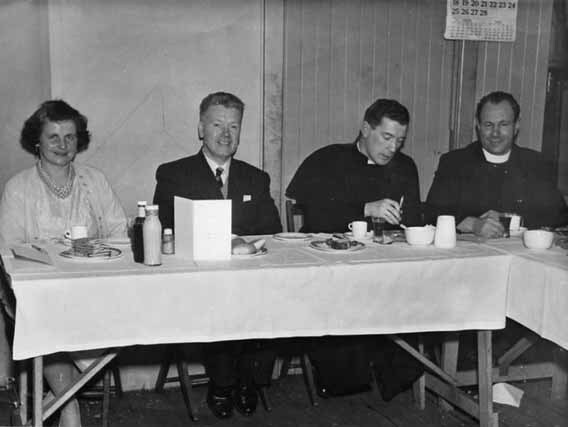 (Bishop Henry Gray Graham (1874-1959), a convert from Presbyterianism, appointed auxiliary bishop of St Andrews and Edinburgh, later parish priest of Holy Cross Glasgow, 1930-59. The foundation stone can be seen on the left of the sanctuary.) It is at least 80 years ago so it is ulikely even the very youngest are still with us! Can You See any Differences? 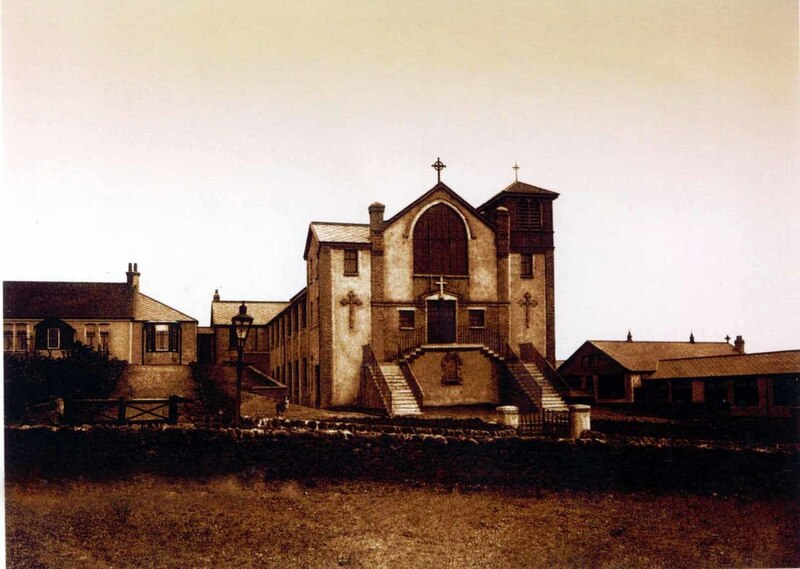 We think this photograph comes from the late 1920s (the church was built in 1925). Note the gates in front of both the driveway and the entry to the church. The BIG difference is the parish house - originally it was just a small bungalow! Next to the church is the old school (also built in 1925) standing on what is now the playground. There is a gas lamp in the street and if you look VERY closely you might see a dog just to the right of it! 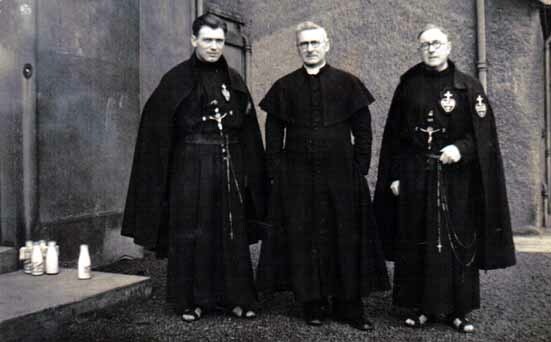 Fr McCabe with two visiting Passionist Fathers who ran a retreat for the Parish.Clearly an early-morning photograph; note the milk bottles and newspaper still lying on the steps! 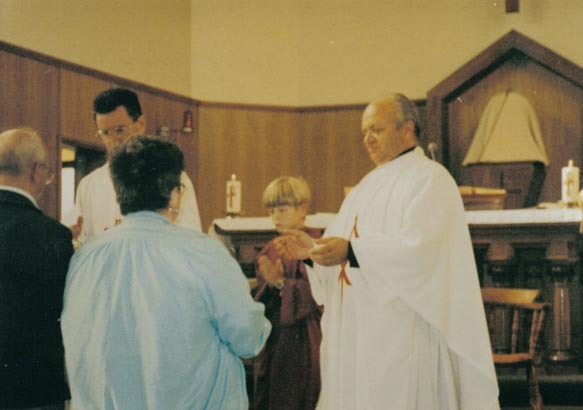 The Passionist Fathers were obviously regular visitors to the Parish. 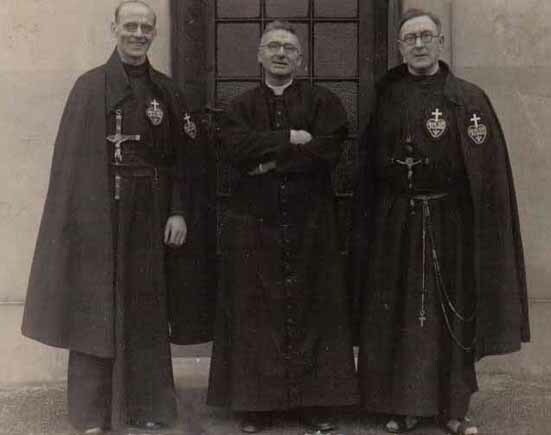 Here is Fr (later Canon) McCabe with two more visitors in the 1940s. 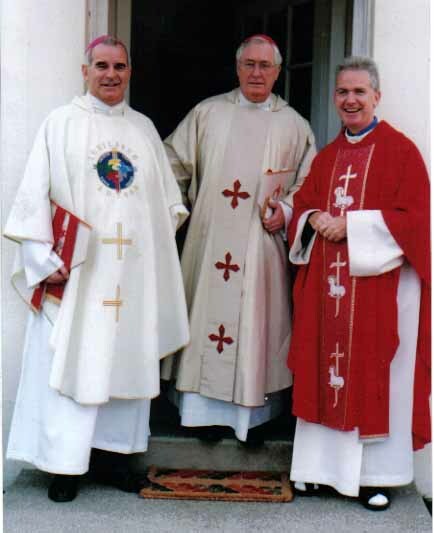 The priest on the left is Fr McCabe's brother. 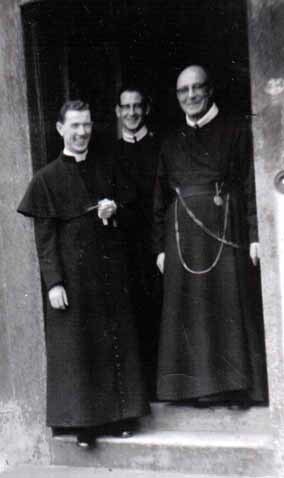 This photograph shows Father William Ferguson (1958-65) on the left with two visiting priests. They don't look like Passionists. Anyone remember their visit? 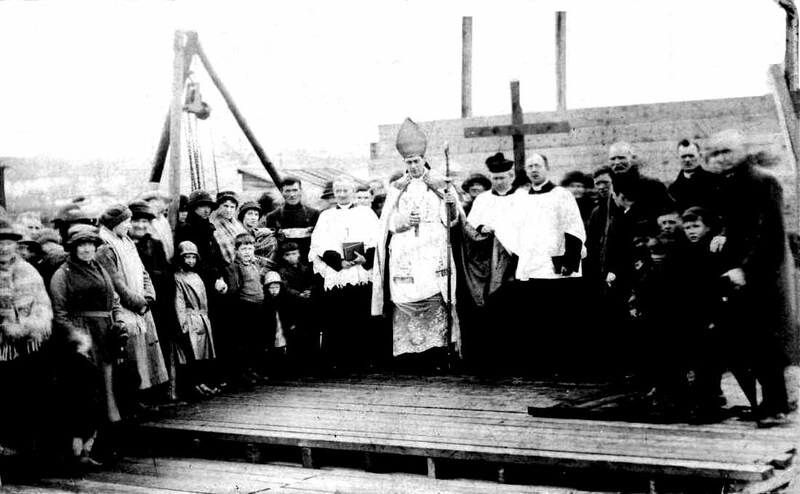 A sad occasion - the funeral of Father Miley in 1928. A procession of priests attended the funeral. There is also a very large crowd of parishioners and friends. 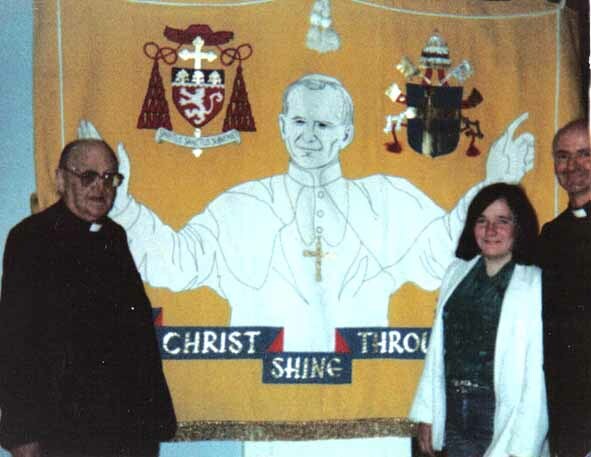 A more recent photograph from 24 Wheatlands Avenue taken in 1987. But not THAT recent - it still shows the old school before it was knocked down to make way for the new school in 1989. And how much of the background would now be covered in new housing? 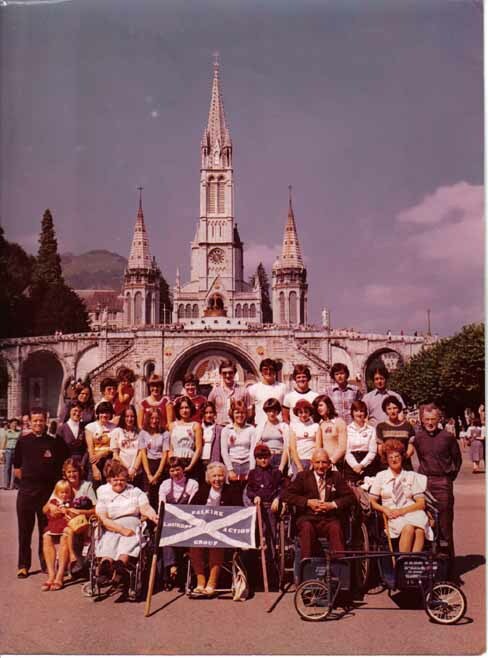 There were several St Joseph's parishioners in this Falkirk District group in front of the Basilica at Lourdes. 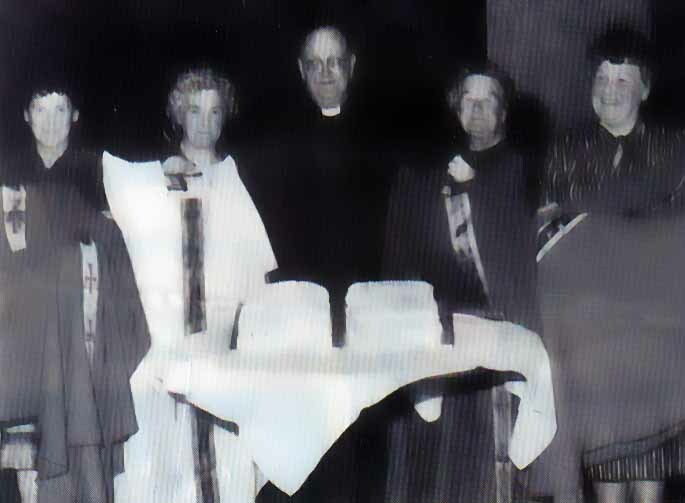 Mary and Francis Quinn at a parish celebration with Fr Ferguson and another priest (far right).Anyone know the occasion, date and mystery priest?